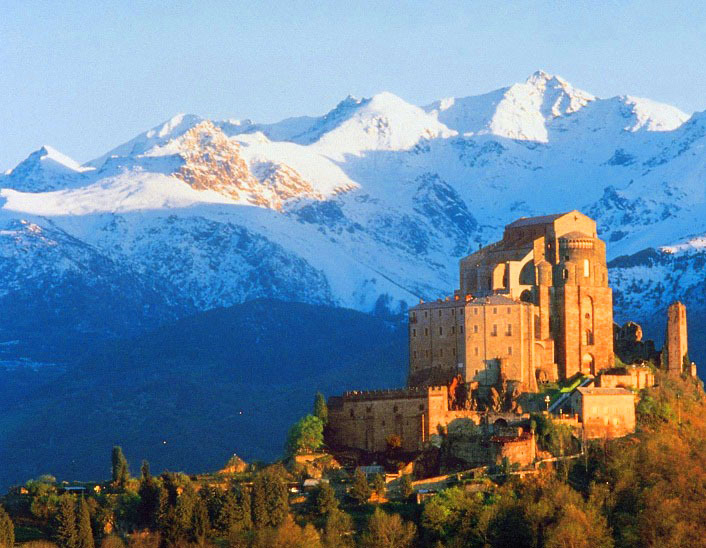 The Sacra di San Michele, half an hour from Turin by road or rail, is without doubt the highlight of the Val di Susa. It is also one of the most important historical buildings in Piedmont and Italy. The monastery is surrounded by legend and mystery. Some say that it was built with the assistance of angels and even the date of construction is unsure, though without a doubt it dates to before the 11th century. It looms menacingly over the entrance to the Val di Susa and the plains of Turin below. Walk up from Sant’Ambrogio – the town at the base of the hill on which the abbey is located. The walk is quite long but the views over Piedmont, Val di Susa and Turin are worth the trouble. If you don’t have the energy for the whole walk and you have a car then you can drive up to just before the stairs leading to the monastery. The long final flight of stairs up to the entrance is awesome - with the monastery becoming more threatening and eerie with each step. To add to the horror movie feel these steps are known as the steps of the dead. The dead of the Sacra di San Michele were once laid out on them for the benefit of the locals from the surrounding countryside. Entrance is through the twelfth century Entrance to the Zodiac. To get into the inner part of the abbey you need to pay €4.00 but it's well worth it. Inside the feeling of being part of something ancient and monumental is overwhelming. Saint Michael's sanctuary, if open, is the oldest part of the abbey dating back at least to the tenth century, but possibly as much as a century or two before. It consists of three chapels on the outer fringes of the abbey. Explore the workshops with the bricks blackened from centuries of smoke from the forges, will definitely make you grumble less about your current working conditions and the museum of daily life in the abbey has much the same effect. The frescoes within are some of the most priceless in Piedmont – many reflect religious scenes of great beauty – but my favourite is the fresco showing the history and myth of the abbey on the wall by the ancient choir. Having made the flippant comments in the previous paragraph, about appreciating modern life, there are also times when the stark simplicity of what life must have been like in the Abbey of San Michele, holds a strange beauty and attraction. Amazing too is the size of the place and the convoluted labyrinthine nature of the Sacra di San Michele is such that as recently as 1987 another room was discovered. Only seven foot wide and long, the room is believed to be the cell of the famous hermit Saint John Vincent. The Sacra di San Michele is an easy day trip from Turin. For more on this lovely city click here. Prefer to stay nearby and explore everything the Val di Susa has to offer? Then the 18th century farmhouse, L'Antico Borgo is perfect. Return to a Secret Italy Index.